Exciting interstate job opportunities and significant lifestyle changes are common reasons why people might choose to move from one state to another. Unfortunately, it can be immensely difficult to move your belongings across such a large distance, let alone moving them away from your familiar surroundings. Fortunately, the team at Transcorp Removals & Storage can provide backloading from Perth to make your relocation easier. 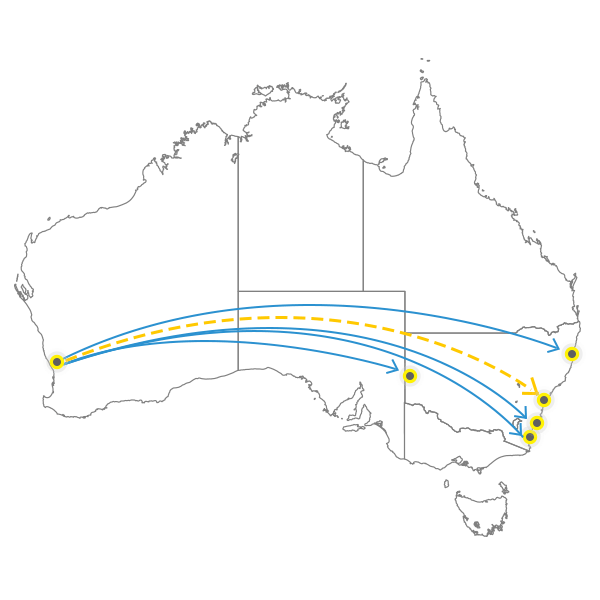 When you need backloading between Perth and Brisbane, Melbourne, Sydney, Canberra, the Gold Coast, Tasmania, Adelaide and Darwin, we have you covered. At Transcorp Removals & Storage, we pride ourselves on making interstate relocations less logistically challenging as well as less expensive. Our expert team can get the job done according to your requirements and preferences while relieving the financial burden that’s generally associated with moving across a large distance. You can rely on us to provide superior backloading between Perth and Sydney, Canberra, Melbourne, Adelaide, Brisbane, the Gold Coast, Darwin and Tasmania. We also boast a fleet of fully-equipped trucks that can secure your belongings and transport them safely to your intended destination. We can be trusted to treat your possessions with the care and respect they deserve. Whether you want to combine your move with another client or use our trucks on their return journey, we can make interstate relocations more affordable and eco-friendly with our backloading services. Make Transcorp Removals & Storage your first port of call when you need professional backloading to and from Perth. Get in touch with us today to request a quote or book our services.